Place butter and brown sugar in the bowl of a stand mixer. Blend until smooth. Add in egg, vanilla and milk and continue mixing until smooth. Add in flour, cocoa powder, baking soda and salt. Add a few drops of red food coloring and stir until a bright red color has been achieved. Add blue food coloring to the other bowl and stir until a dark blue has been achieved. Use a small ice cream scoop to scoop the batter onto your temp-tations® Lid-It®. Bake for 20 - 22 minutes or until one springs back when touched. 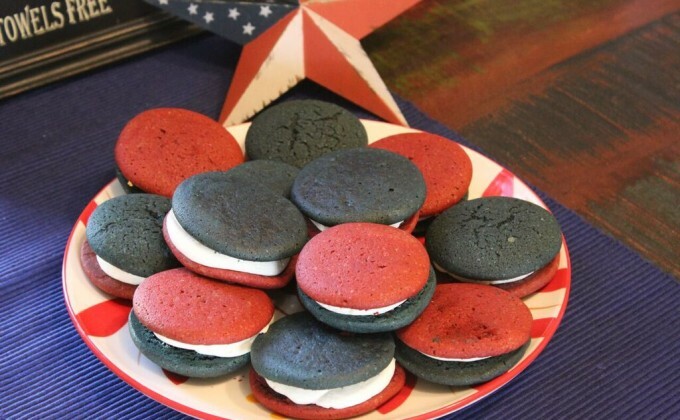 Cool completely, remove from Lid-It® and spread two tablespoons of frosting onto the flat side of each red cookie. Top with blue cookies and serve.